While all the top dogs of the casino industry are preparing for the ICE London conference, NetEnt fires off another announcement for one of their latest upcoming releases. NetEnt is releasing a somewhat refreshing slots game – Temple of Nudges. Although in its essence, the slot is not a grand revelation for the slots community. Nonetheless, it does look decent relative to other NetEnt releases. Surely enough, Vikings did not seem to disappoint, as we have already seen on our stream. Nonetheless, let’s dig right into this Temple of Nudges slot review and see what exactly this game has to offer. At first glance, we get the NetEnt usual – five reels, three rows. Nothing out of the usual layout-wise that gives up what to expect about the game. After a bit of poking around, we find that the betting range lies between €0.25 and €250. Now, that gives some reason to believe that the variance for this game lies somewhere between medium or high. On top of that, we have 243 bet ways. The theoretical RTP stands at 96.03%, according to the info sheet. As you open the Temple of Nudges slot, the intro screen shows something about the Nudge Feature and Re-Spin Feature, but that’s about it. On the surface level, we see a total of eight symbols – four premium and four basic. BUT! No wilds or scatter symbol. That’s not a sight you get to see that often nowadays. However, even if that’s true, that does not necessarily mean that there’s no value to the game. But if there’s something with little value in this game – it’s the symbols. The theoretical maximum win a single betway stands at just a sad 0.46X, while the maximum coinciding win is 87.48X. 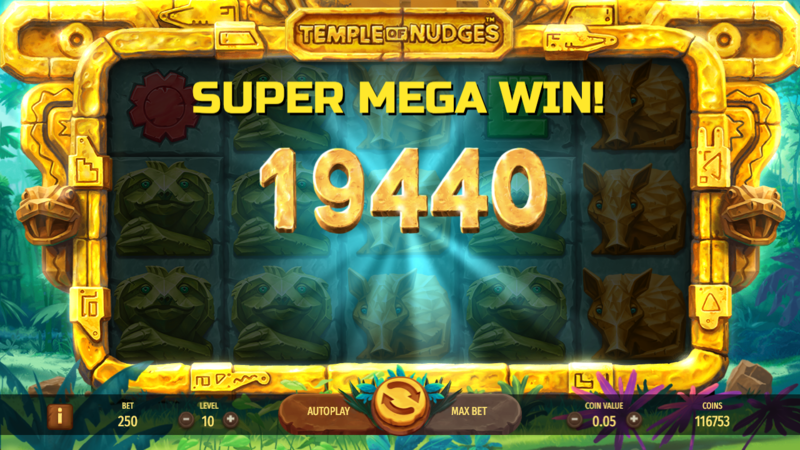 Now, the core feature of the game, as the name of the game – Temple of Nudges, indicates, is the Nudge Feature. As the info screen explains, every time there is a winning combination, the feature is triggered. Once it triggers, the tiles are pushed down one row, and a new row appears on the top. Every connection as a result of the nudge is counted as a new win. This continues until no more symbols connect. Theoretically, the feature may trigger infinitely but inevitably, that would never be the case. Nonetheless, with the right combination of symbols, as usual, there is some potential for a decent win. As for the Re-Spin Feature in the Temple of Nudges slot, it’s a whole different beast. At any point during a winning combination, one of the non-connecting symbols might appear with a re-spin tag. If it does, the winning symbols remain intact, and all others get hit with a respin. Thus, giving the player a shot for, say, a full screen or a chance for another pay way. 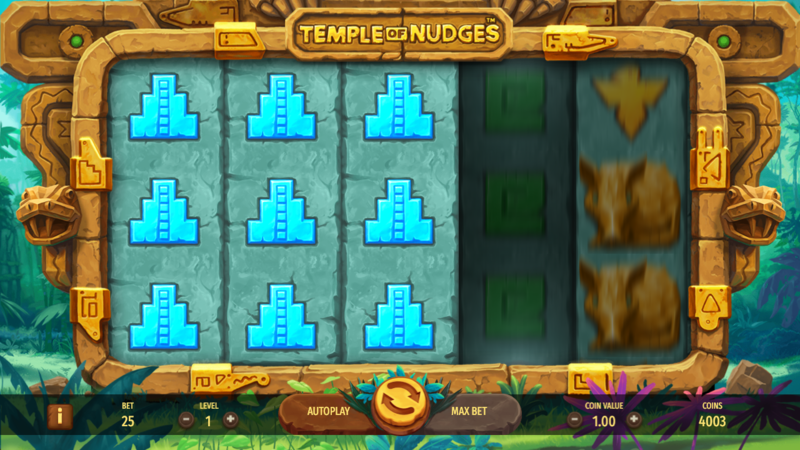 The design for the Temple of Nudges slot is indeed something invigorating for NetEnt. Their past slots, like Turn Your Fortune, have been just pretty averagely looking. At first glance, I thought I was playing Jaguar Temple by Thunderkick. This game is undoubtedly great looking. The details are well drawn out, the symbols are quite refined and so is the background. Even the UI has had a little bit of a makeover for this slot. Same could be said about the general sound design. The soundtrack has this tropical, jungle vibe going on, accompanied by the exotic wind instrument and percussion sound effects. 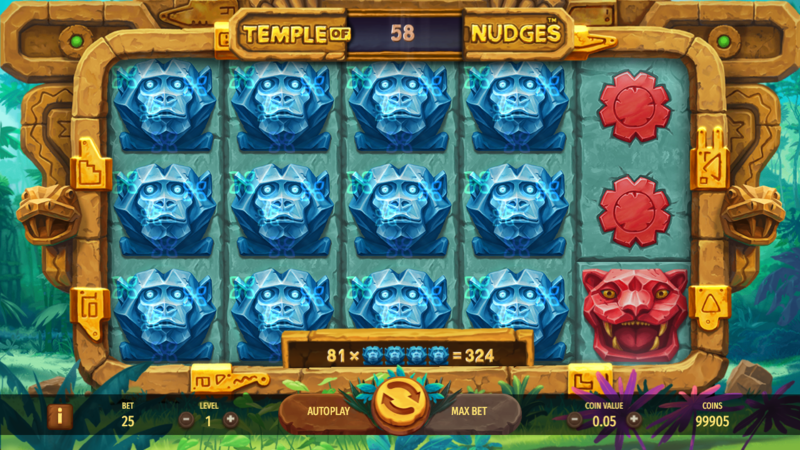 All in all, the design for the Temple of Nudges slot carries a very modernly designed vibe to it. Unfortunately, this might be the most prominent feature of the game. 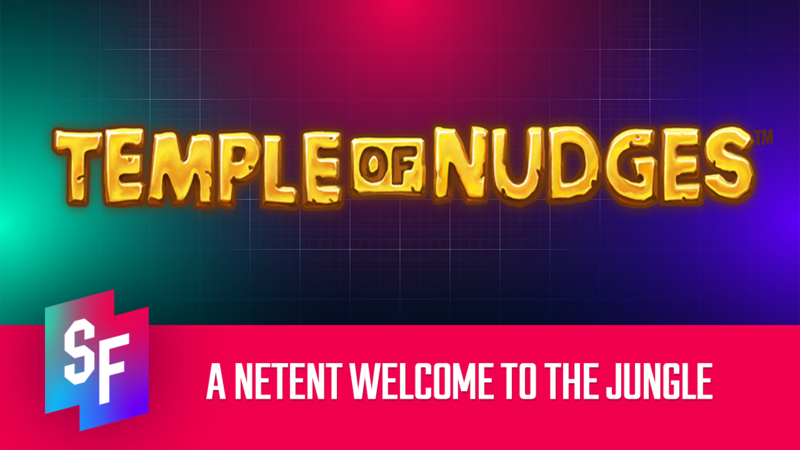 To wrap it up, the Temple of Nudges slot by NetEnt certainly has its charm. It’s good looking, has a fresh new face and make-up, a little bit of an exotic look. It says all the right things but still seems to disappoint. Deep down inside, the slot is a bit empty. You need to squeeze it and be ready to lighten your pockets before it returns the same or more. In all seriousness, the Nudge Feature does seem to look like it could pay, but the stats don’t seem to say it. Sure, it has the 243 payways, and the nudges go on forever (theoretically). But knowing NetEnt, this formula seems a bit too fishy to trust this slot all your money. You can give some of it, but don’t expect a lot back. Nonetheless, you can trust us or be your judge and take a look at the game yourself when it releases on the 21st of March this year. Until then, give some other slots a shot. Why not try them out on SlotsMillion with our exclusive bonus deal?